Letter from Ramsar Convention on Wetlands to the Ministry of Environments and Forests of the Government of Bangladesh. Editor’s Note: This is a translation of a Facebook post published by Kallol Mustafa on the 23rd of June, 2013. The text of the original note, which is in Bengali, follows the translation. Regarding the plan to build a coal-burning power-plant right next to the Sundarbans which is a Ramsar Site. Based on media reports, the Ramsar secretariat expressed concern that if the planned Bangladesh-India joint venture to build a power-plant at the ecologically critical area 1-2 kilometers away from the conserved forest of Sundarbans goes ahead then it would result in the emission of an excessive amount of carbon-dioxide as well as other other dust. This eventually could result in putting the animal and plant-life diversity in that region at grave risk. Therefore, the Ramsar secretariat asked for an EIA (environmental impact assessment) for a possible impact on the Sundarbans. Regarding the loading and unloading of coal at Akram point in the Sundarbans. 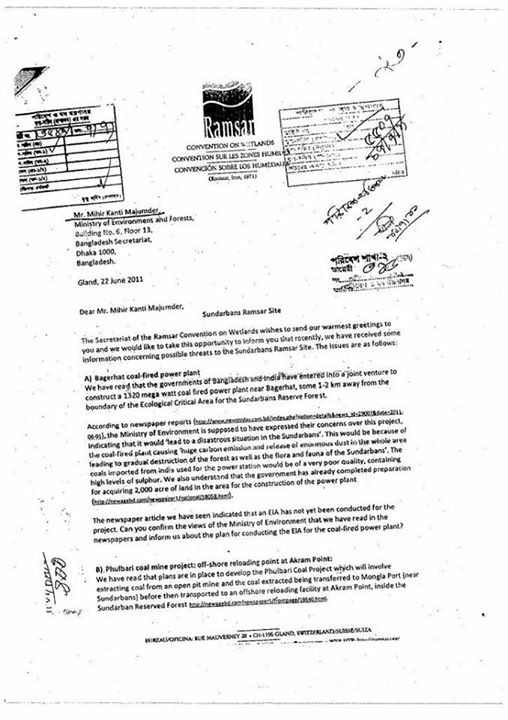 The Ramsar secretariat wanted to know, in relation to the Phulbari coal power-plant project, about the possible negative impact on the Sundarbans that would result from increased shipping traffic, the loading and unloading of coals, and the building of new physical infrastructure at Akram point. On the possible negative impact of building a ship-yard and silos within the Sundarbans conservation area. 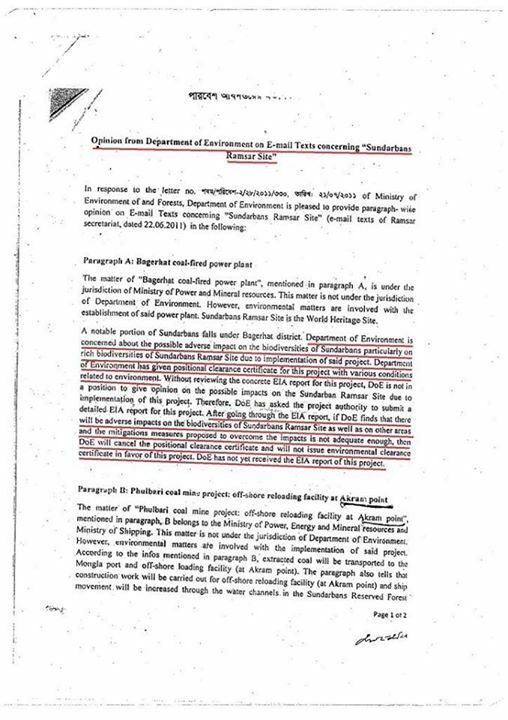 After receiving this letter from the Ramsar secretariat, the Ministry of Environment and Forests sent out letters, soliciting opinions, to the Directorate of Forests, Department of Electricity, Department of Fuel and Mineral Resources, Department of Shipping, Department of Industries and Department of Food. Of these, the Department of Food and Department of Industries refrained from expressing any opinion. The Department of Electricity and Department of Fuel and Mineral Resources extolled the virtues of the proposed project, avoiding the main question and offering hocus-pocus instead. However, what is noteworthy here is that in regards to this project that the government is in a hurry to carry forward without any proper environmental assessment, there are departments within the government, such as the Directorate of Forests and Environment, and the Department of Shipping, who have expressed strong objection to the construction of a coal-burning power-plant that might harm the Sundarbans. It is not possible for a government department to object more strongly than this to the proposed power-plant at Rampal. One is curious to know if the Chief Conservationist has gotten anywhere in his efforts in obstructing the imperial interests of India which is an alley to the government. Letter of dissent from the Directorate of Forestry to the Secretary of the Ministry of Environment and Forests. It should be noted here that a long time has passed since this letter was issued by the Environment Directorate, and in the meantime an EIA has been published, which has been rejected by experts in a public hearing, and the government, in violation to the conditions of the positional clearance certificate, have filled up the wet-lands even before the said EIA was issued. But the Directorate of Environment, contrary to its promise, has not cancelled the positional certificate, and hasn’t issued any official statement regarding the EIA. However, the Environment Directorate hasn’t yet issued a clearance certificate in favour of the Rampal project. 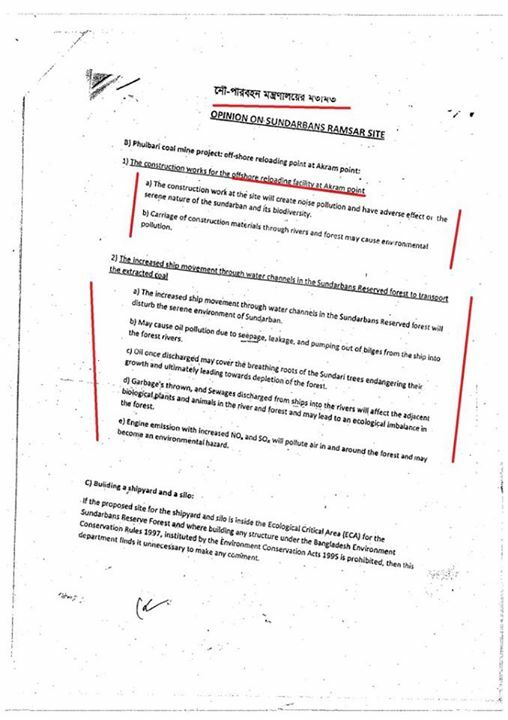 a) The construction work at the site will create noise pollution and have adverse effect on the serene nature of the Sundarbans and its biodiversity. b) Carriage of construction materials through rivers and forests may cause environmental pollution. 2. The increased ship movement through water channels in the Sundarbans Reserved forest to transport the extracted coal. a) The increased ship movement through water channels in the Sundarbans Reserved forest will disturb the serene environment of Sundarbans. b) May cause oil pollution due to seepage, leakage, and pumping out of bilges from the ship into the forest rivers. c) Oil once discharged may cover the breathing roots of the Sundari trees endangering their growth and ultimately leading towards depletion of the forest. d) Garbages thrown, and Sewages discharged from ships into the rivers will affect the adjacent biological plants and animals in the river and forest and may lead to an ecological imbalance in the forest. Letter from the Ministry of Shipping expressing dissent. 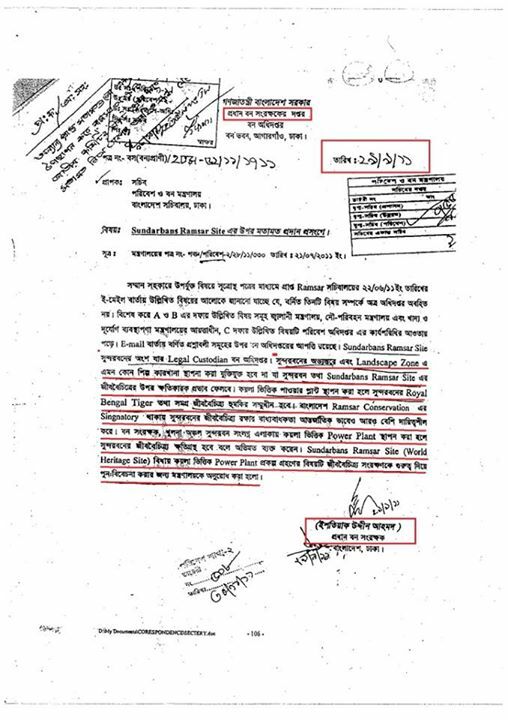 Thus we can see that it not just the general people and members of the National Committee to Protect Oil Gas Mineral Resources Port and Power but also the various departments of the government have raised serious objections to the proposed coal power-plant at Rampal. Kallol Mustafa is an engineer and an environmental activist who has written widely on Rampal. He was recently quoted in this Time article on the Sundarbans. এর চেয়ে স্পষ্ট ভাবে সরকারের একটা অধিদপ্তরের পক্ষে রামপাল কয়লা ভিত্তিক বিদ্যুৎ প্রকল্পের বিরোধীতা করা সম্ভব নয়। জানতে আগ্রহ হচ্ছে, সরকারের বন্ধুপ্রতীম ভারতীয় সাম্রজ্যবাদের স্বার্থে এভাবে বাগড়া দেয়ার পায়তারা করায় প্রধান বন সংরক্ষককের কি গতি হয়েছে! Previous Where have all the negotiating tables gone?